The development of Britain’s airfields has been both rapid and complex. The design, layout and specific requirements of airfields changing as the need for areas suitable for larger and more powerful aircraft arose. From the early days of flight through the expansion period of 1934-1939, and on into the cold war, Britain’s airfields have become iconic symbols not only of Britain’s defence, but also the rapid development of air travel. The range of airfields is as wide as their developmental history: fighter; Bomber; Coastal Command; Emergency Landing Grounds (ELG); Relief Landing Ground (RLG); Satellite Landing Grounds (SLG); Advanced Landing Grounds (ALG) and Cub Strips, not to mention the fake ‘Q’ sites along with the various training, glider and ATC sites. It is a very detailed and complex subject, and one in which there have been many valuable and in-depth texts written. It is a subject that is far too detailed to cover in its entirety here, but by focusing on the main features of airfield development, we can at least shed some light on the huge undertaking that reshaped the British landscape, and whose effect has been long-lasting, becoming the widespread topic of interest it is today. The Royal Air Force was formed on April 1st 1918 through an act of Parliament that saw its predecessor, the Royal Flying Corp, mutate into what has become not only one of the premier fighting forces of the world, but also the oldest Air Force in the World. However, in the post-war era following the First World War, political opinion was very much against the continuation of the RAF, feeling that it was exhausting an already depleted national economy and contravening a stern non-rearmament policy. In addition, an apathetic and vehemently pacifist post war public was also hard to convince that a third force, which was seen as ‘weaker’ than its two older sisters, was really necessary. Two men, Winston Churchill (then Minister for War) and Air Marshal Trenchard (as Chief of the Air Staff), crusaded on behalf of the RAF, seeing it as the valuable asset it had become. In the Trenchard memorandum of December 1919, Trenchard outlined the biggest re-organisation of the Royal Air Force in history, a change that included everything from insignia and uniforms, to buildings and training. It was a change that would establish the RAF as an air force capable of mobilisation and expansion at a moments notice. To achieve these goals, Trenchard would set up a rigorous training plan, with stations specifically designed to deal with the various aspects that would be needed; an Air Force Cadet College at Cranwell, a flying training school for Air Force Staff in Andover, a further scheme for short-service commissions and a technical college at Halton (set to close in 2022) in Buckinghamshire. 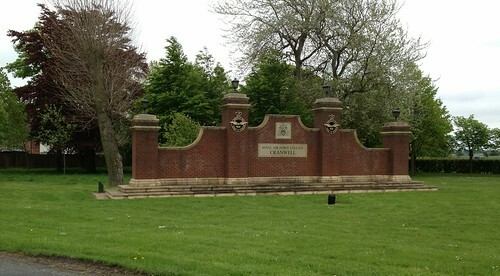 RAF Cranwell in Lincolnshire remains the Officer Training College today. This re-organisation would be a re-organisation for survival, and would involve the disbandment and demobilising of vast numbers of men and women; the subsequent rundown of the RAF being both rapid and immediate. By March 1920, in excess of 23,000 officers, 21,000 cadets and 227,000 other ranks and been demobilised and returned to ‘civvy street’. The new RAF was small, formed with just 3,280 officers and 25,000 other ranks. Assets too were stripped, airfields were sold off and hardware disposed of, but the Air Force was going to survive as an independent fighting force that would become a major peacekeeping force within the next few decades. In the 1920s, and even though limited by the 10 Year Rule on defence expenditure, Trenchard envisaged a build up of the Air Force, incorporating both fighters and bombers, to a level that would be both powerful and dominant. He set a target of some 52 Home Defence Squadrons, but his continued battles with the Army, Royal Navy and politicians alike, meant that this figure would take many years to achieve and Britain would be poorly protected in the case of attack. Whilst slow, the 1920s and early 1930s did see the RAF expand, achieving 65 squadrons by January 1st 1935, mostly manned by fully trained reserves. This did however, do little to bolster the front line numbers of available fighters, and as demands for spending cuts in the world’s depression started to bite, this build up began to slow even further. It was during these early 1930s that movements in Germany, in particular with Hitler and the rise of the Nazi Party, gave rise to an uneasy feeling across Europe; a feeling that would lead to new policies being implemented, policies that would refuel the impetus of Britain re-arming its major forces in the latter half of the 1930s. With events like the Schneider Trophy and displays at Hendon capturing the imagination of the public, the Government saw these as a way to develop new faster and more agile aircraft, and as a pedestal on which to put both Britain and the RAF. These air displays continued until 1937, when a war with Germany became evermore likely, and the previously formed rearming policies began to take shape. German boasting of its redevelopment was barely enough to hide the fact that it was rearming as early as 1932, and the speed at which this was happening would far outstrip the RAF’s meagre numbers in the years following the Nazi’s rise to power in 1933. In these early years, Britain’s bomber strength was as low as five night, and six-day bomber squadrons, each one operating limited, slow and cumbersome biplanes. Aircraft that were no match for even the reduced force that Germany was to front during the controversial Spanish Civil War. Germany’s rearming was occurring at an alarming rate, and after Goring’s inauguration as head of the Reich Commission for Aviation, a formal request for the purchase of British aircraft, by Goring, was refused, but ironically not the supply of two military supercharged aero-engines that were to be built under license in Germany! Britain was not alone in this action though, the USA also sold Germany contravening merchandise during the 1930s, 19 aircraft and 569 aero-engines crossed the Atlantic, with most of these being supplied during 1934. *1 Perhaps even more astonishingly, the World War 1 German Ace Ernst Udet visited the US in the 1930s, where he developed not only ground attack and dive bombing techniques, but purchased two Curtiss Hawk II biplanes, which were taken back to Germany for evaluation for future dive bomber designs. This action eventually led to the Germans developing the Junkers Ju-87, famously known as the ‘Stuka‘, an aircraft that wreaked fear and havoc across the European continent. Although the depression of the 1930s held German production back, the number of air-frame plants rose from 2,813 in January 1933 to almost 38,000 in 1935. This rearming was becoming so rapid, that in 1933, six new aircraft manufacturers joined the seven already established – all diversifying from other engineering areas to begin aircraft manufacture. By 1935, the total number of air-frame and aero-engine plants had risen to an astonishing 53,865, an increase of nearly 50,000 in just two years. This increase eventually led to a number of changes in Britain. One such change was the demand for a twin-engined aircraft capable of delivering a 1,000lb bomb up to 720 miles away. Whilst not record-breaking, specification B.9/32 led to both the Wellington and the Hudson being developed, each a major step forward from the biplanes in RAF service at that time. A further major change that the German action brought about, occurred during the mid – late years of the 1930s (1934-1939) where Britain saw, what is now commonly referred to as, “the Expansion Period”, a period in which the RAF began to increase its numbers also. It was during this period (between May and July 1936) that the idea of Trenchard’s small elite force would become four; the Air Defence of Great Britain (ADGB) along with No.1 Air Defence Group and other administration and command groups, would be disbanded and reformed as four new commands: Fighter Command (HQ at Stanmore), Bomber Command (HQ at Uxbridge), Coastal Command (HQ at Lee-on-Solent) and Training Command (HQ at Ternhill). In addition, new aircraft were going to be required, particularly fighters and heavy bombers, and to support these new aircraft, a massive support network: new training facilities; aircraft and aero-engine factories; storage facilities; armaments factories; flying schools, and of course a range of new airfields would be needed. Running in conjunction with this would be research and development. The RAF’s budget, which included research and procurement, rose from £17.5m in 1934-5 to £74.5m by 1938-39 – a massive injection of cash to help develop these new ideas. This demand would begin the process by which Britain would develop its airfields and air force, kick starting the huge economic and technological change that would see Britain move from the simple bi-plane to jet technology, and airfields that covered not just a few, but several thousands of acres of land across the British landscape. Britain had entered the arms race with Germany, and it would be a race to the death. The expansion period and airfield development. In this, the expansion period 1934-39, airfield development would become a prime factor in the RAF’s own development. The driving force behind this was the need to increase the numbers of front line aircraft, both fighters and bombers, if Britain was to be able to match Germany’s growing armed forces and her desires over Europe. To this end, a number of schemes were created, each one building upon the previous through adaptation of technological development, design improvement and political pressure. A continuation of updating meant that the face of the British airfield would change considerably from 1934 to the end of the war in 1945. This development would then go on post war as the world entered the jet age and nuclear deterrent. Whilst many of Britain’s original airfields dated back to the First World War, the vast majority had vanished, (of the original 301 only 45 remained and of these 17 were civil*2) the rest being sold cheaply in the reorganisation of the post war RAF. Of those that did remain, many were poorly kept, the permanent huts that had been built were in poor condition and flying surfaces totally inadequate for the heavier aircraft that were envisaged. Many of these airfields were located around London (including Biggin Hill and North Weald) and were built on a clay subsoil, a soil that holds water and led to numerous accidents as aircraft landed badly. The RAF began to apply pressure on the Government, but with no real direction, there was little hope of achieving anything more than lip service. Early biplanes formed the backbone of the interwar years. The Government finally realising that change was needed, formed a new department, whose role of executing these new plans it fell to. The Air Ministry Directorate General of Works (AMDGW) under the control of Ernest Holloway, oversaw the process with the new Air Ministries Aerodromes (later Airfield) Board, being responsible for identifying the new airfield. The Lands Branch of the Air Ministry would purchase the land, and then the construction, development and maintenance would be carried out under contract, by civilian organisations, to the Air Ministry. This process took airfield design through a series of successive alphabetically listed schemes commencing with ‘A’ (not to be confused with Class ‘A’ airfields that emerged much later in 1942) progressing through to ‘M’. Due to the rapid changes in these designs though, not all were implemented, many being absorbed into subsequent models before they could be administered. The future development and expansion of the RAF would be built-in to these schemes, restricted initially by the monetary cost of such a plan. But the overall aim would be to build the RAF up to full strength within eight years (1942). The key to these designs was continuity and replication. By creating a series of standard design drawings for everything from latrines to heating systems, hangars and runways, airfields could be ‘mass produced’ with ease, saving both time and money, which was paramount if the RAF was to be ready for the forthcoming war. Scheme A – (adopted in July 1934) is the scheme that set the bench mark by which all future schemes would develop, and called for a front line total of 1,544 aircraft within the next five years. Of these, 1,252 would be allocated specifically for home defence. This scheme was responsible for bringing military aviation back to the north of England, Norfolk and Suffolk, of which Marham (the first), Feltwell and Stradishall were among the first completed. These airfields were designed as “non-dispersed” (or compact) airfields, where all domestic sites were located close to the main airfield site, and not spread about the surrounding area as was common practice in war-time airfield designs. At this stage, the dangers of an air attack were not being wholeheartedly considered, and such an attack could have proven devastating if bombs had been accurately dropped. It was thought that by having personnel close by, airfields would run both economically and efficiently, and of course they could more easily be protected from ground forces. Scheme ‘A’ would also introduce the idea of standard building designs, in which all new airfields (and older original airfields) would now be built to. Scheme C – adopted May 1935 following Hitler’s boast to Anthony Eden that the German Air Force had surpassed the RAF’s in number, a claim that has since been discounted. This would develop bomber bases within flying distance of Germany (notably Lincolnshire and Yorkshire), and proposed creating a further 70 bomber and 35 fighter squadrons accommodating 1,500 front line aircraft within two years. Scheme F – replaced Scheme ‘C’ and was approved in March 1936. Scheme ‘F’ expanded the defence force, further increasing front line numbers to 1,736 with a foreseeable number of 2,500 by 1939. This scheme saw the creation of additional factories in close proximity to the already adopted car manufacturing plants in the industrial midlands. A move that was intended to assist with the supply of new aircraft and aircraft components. Such was the industrial output at this time that Aircraft Storage Units (ASU) had to be specially set up utilising land on already established Flying Training Schools. These ASU stations would be specifically created to assemble or disassemble aircraft for transport to fighter bases, either within or outside of Britain. Scheme ‘F’ would also create further new front line airfields, examples including: Debden, Upwood, Scampton and Dishforth, with further updating being implemented at previously built airfields. Scheme J – only reached proposal, but would have provided the RAF with 2,400 front line aircraft. It was considered too expensive and rejected in lieu of Scheme ‘K’. Scheme K – reached proposal in March 1938, but was considered too small following the German’s annexation of Austria. A further review was requested which accelerated the expansion, and was proposed a month later as Scheme ‘L’. Scheme L – passed by the Government on 27th April 1938, it called upon industry to produce the maximum output possible over the next two years. Superseded by ‘M’ after the Munich crisis, new airfields included: Binbrook, Leeming, Middle Wallop, and Horsham St. Faith. This scheme required 2,373 front line aircraft in 152 squadrons, and focused on fighter Command; in particular, increasing the number of fighter pilot training units. Scheme ‘L’ also called for increased accommodation facilities to allow for this increase in trainee pilots, and it called for new RAF Hospitals, the first of which was at Ely in Cambridgeshire. Scheme M – approved on 7th November 1938 and called for 2,550 front line aircraft by March 1942. Airfield examples included: Swanton Morley in Norfolk, Coningsby in Lincolnshire and West Malling in Kent. This scheme introduced the ‘J’ and ‘K’ hangars, implemented as part of austerity measures, one of the few permanent buildings now on site. By the outbreak of war the RAF had a force that equalled less than half that of the Luftwaffe, Fighter Command possessing only 1,500 aircraft (less than was required under Scheme ‘F’), of which many were already outdated or inadequate. Bomber Command had 920 aircraft, but nothing was bigger than a twin-engined aircraft with limited capabilities. 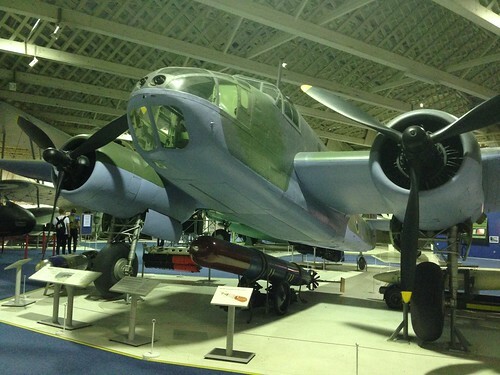 The RAF’s front line bombers were twin-engined with limited capability. The four Commands created out of the ADGB were also undergoing dramatic change, with aircraft being distributed more appropriately and groups being formed to streamline operations. Whilst still far below the levels at which the Luftwaffe were operating, the RAF had over the last few years seen a major reconstruction process, both in terms of aircraft and airfield development, along with major changes in the Air Force’s structure. As aircraft were designed to perform different duties, airfields within their commands would also differ in their operation and construction. Hangars or watch offices for example, would be designed but modified depending upon the nature of the airfield they were servicing. Standard buildings would be altered to suit the different needs of the different duties, and airfield design would take a change in direction, the non-dispersed site being discarded for the safer, but less efficient, dispersed site. As the years progressed, further changes to airfield development would occur as new, larger and heavier aircraft were developed. The four engined heavies: Stirling, Halifax and Lancaster, determining new designs and new requirements. The entrance of the USAAF in the European theatre also played a part in airfield design and development, and by 1942, a new standard would be devised by which all future airfields would be built. 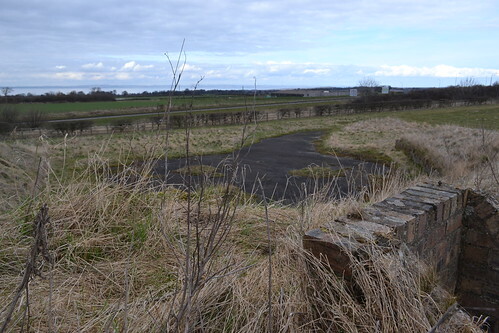 The Class ‘A’ airfield became the standard airfield design for bomber airfields, with many fighter airfields, training and temporary airfields remaining either as grass or using a form of steel matting. Twelve different types of matting were developed during the war, the most common being – Sommerfeld Track, Pierced Steel Planking (PSP – also called Marston Mat), or Square Mesh Track (SMT). The Class A was determined primarily by its runway layout and measures, formed around three intersecting runways at 60o to each other, the main was 2,000 yards long with two subsidiaries of 1,400 yards, each 50 yards wide. An extension of 75 yards was provided alongside the runaway to allow for emergency landings. In addition, another grass strip clear of all obstacles was also provided, these measured 400 and 200 yards respectively. The Class A would set the standard from now on, the British airfield was now a major geographical conurbation. They were now like small towns, with cinemas, gymnasiums and other recreational facilities, they had dispersed accommodation areas, technical sites, large aircraft maintenance sheds and hard runways that only a few years earlier were unheard of. Each of these schemes brought new requirements for airfield designs; their layouts and buildings were changing almost as fast as aircraft development. The airfield had finally evolved. In the next part we look at the way in which a site was chosen, the number of agencies involved and the criteria for airfield location. Choosing an airfield site during these prewar periods was especially difficult as there were many ‘unknown’ factors to predict, a factor in itself that helped determine the needs of each of the various schemes mentioned previously. However, there were a number of airfields already in situ, some used by the military and some used by civilian aviation. As remnants of the First World War, many military sites were inadequate or inappropriate for the growing future needs of the RAF, but with some work, they could be developed into workable sites as the basic infrastructure was already there in place. As well as these RAF sites, there were also civilian airfields, which the Government considered as potential military airfields. Because civil aviation had grown amongst the wealthier members of society, although not exclusively, this meant that in the pre-war period, there were some 90 airfields*4 owned either by local councils or under private ownership. Many of these were requisitioned by the authorities, but because many were small or located very close to built-up areas, (in 1928 the Air Ministry ‘encouraged’ towns of 20,000+ inhabitants to have a municipal airport), they were not suitable for modern fighter or bomber aircraft. As a result, many of these became training or maintenance sites, some linked to aircraft production facilities, but none were ‘operational’ for fighting units. A further group of airfields in use at this time, were those of the AA (Automobile Association – better known as a motoring organisation). The AA Landing Grounds were often ex First World War sites located near to hotels and other places of interest to the motorist. Fuel was usually supplied at, or near to, each site, and each one was ‘tested’ by an aircraft on behalf of the AA before it was granted AA status. As these sites were registered, their locations were readily available to the Germans and so they were closed and rendered unsuitable for aircraft. However, land in close proximity was occasionally used, and so a new site would be created in a similar location. With all these sites available, one would imagine choosing a site and developing it, would be relatively straight forward, but this is far from the truth. Many of these sites were inadequate, and the process of repairing/upgrading or rectifying it was simply not going to be sufficient. Therefore, many new sites were going to be required and the process by which a site was identified, acquired and then subsequently developed was not at all straightforward. In each case the Air Ministry Directorate (AMDGW) and Air Ministries Aerodromes Board would work in very close conjunction with numerous other Government departments and interested public bodies. These would include local Electricity Boards, Drainage Boards, the Geological Survey Department and the local War Agricultural Committee, who were concerned about flooding caused by run-off from the sudden building of large expanses of concrete. In the first instance, using an ordnance survey map, areas that were below 50 feet above sea level or above 650 feet were generally ignored, the former being prone to flooding whilst the latter suffering high levels of low cloud or hill fog. Next a circle with a radius of 1,100 yards was marked off, this had to be flat with minimal rise in the ground layer. It also had to be free from obstructions and ideally at least three miles away from any other flying location. Next officers from the Air Ministries Aerodromes Board would walk the site, field by field, recording maximum landing distances, and noting any unidentified obstacles, trees, hedges, ditches or more permanent structures that would need removal. By September 1939, board officials had identified, examined and recorded around 4,000 possible sites in the U.K. Many would be simply filed away never to see aviation of any kind, whilst others would become famous for years to come. Once a suitable site had been identified and examined, the local geology had to be established where possible. In the pre-war years, no consideration was given to hard runways, they didn’t exist in any real form and were not seen as needed as any aircraft of that time could happily take off from a grass strip. 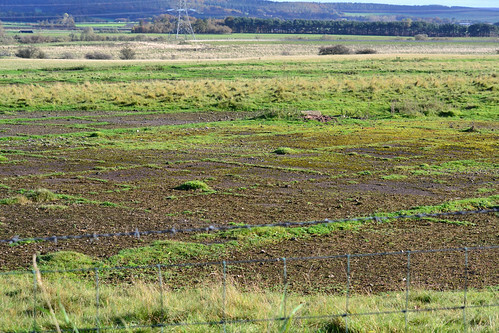 However, in order to prevent aircraft wheels from bogging down, or flooding closing an airfield, well-drained soils were absolutely paramount. Once the site had been accepted, the land was requisitioned, forcibly purchased using new powers created under the Emergency Powers (Defence) Act 1939. This gave virtually immediate access and ownership of the land – with little notice to the land owner – to the Government. These powers also saw their way to reducing the ‘NIMBY*5 effect, protests against developments being side-lined through political clout. The next stage in the process was to put the job out to tender. The difficulty here was that secrecy was of the utmost importance, and so little of the detail was released other than an approximate location. As the war progressed, the number of construction companies involved became fewer, and those that were involved more established, prime contractors being Wimpey, Laing, Taylor-Woodrow and McAlpine – all of whom went on to be major construction companies post war. That said, no major airfield would generally be completed by one single contractor, as the whole process required a wide range of skills based operations. As one completed their task, another would come in, sometimes dual operations would be carried out simultaneously. For example taxiways and access roads may have been built by Tarmac, whereas the runway may have been built by McAlpine. Accommodation areas often used ‘Nissen’, or in many USAAF cases, ‘Quonset’ huts, many of these and other ‘standard’ buildings were erected by buildings contractors whereas other more substantial buildings may have been built by John Laing and Co.
By the outbreak of war, 100 sites had been purchased, as the number was relatively small, the board were able to be ‘particular’ in their choice, something that was quickly disregarded as the war progressed. Airfields are highly labour intensive projects requiring an enormous workforce and extensive heavy machinery, little of which were available in the early 1940s. Irish labour provided the backbone of the initial workforce, whilst heavy plant came in from the United States. At its peak there were some 60,000 men employed on airfield construction, all of whom were unable to spend their time rebuilding the devastated towns and cities of the UK. As the war progressed, the Royal Air Force Airfield Construction Service began taking a greater role in airfield construction, diversifying away from their original role as repairers of damaged airfields sites. There would be an initial 20 squadrons created to carry out these tasks, with a further 6 being formed later in the war. With squadron numbers ranging from 5001 to 5026, they would be initially involved in the updating of older sites and the creation of ALGs, eventually taking on a much greater responsibility of airfield construction. These squadrons, were of course given great assistance by the well established Royal Engineers. In 1942, the United States joined the European theatre sending their own Engineer Aviation Battalions to the U.K. Their task was to support these British squadrons by building their own airfields ready for the huge influx of men and machines that was about to arrive. 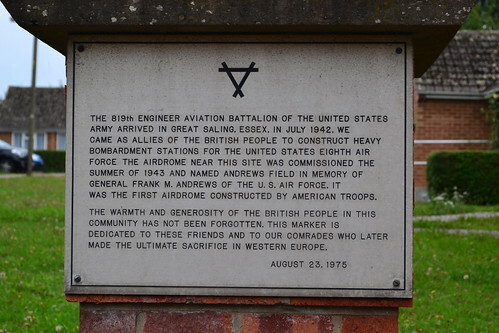 The first site completed by the Americans and opened in 1943, was Great Saling (later renamed Andrews Field) by the 819th engineer Aviation Battalion. Not being experienced in U.K. soils, it was a steep learning curve fraught with a number of initial problems. RAF Andrews Field memorial to the 819th Engineer Aviation Battalion. In 1939 there were only 60 military airfields in the UK, by 1940 this had increased to 280, almost tripling to over 720 by 1945. Between 1939 and 1945 444 airfields*2,4 new airfields were built by these organisations – an amazing feat by any standard. Using almost a third of Britain’s total construction labour force, they were often open and manned within a matter of months rather than years. This whole process however was not fool-proof. In a number of situations sites were identified and requisitioned, but not developed. In several cases they were partly built, and in others like RAF Cottam, they were completely built but then never occupied. Some airfields were identified for USAAF use, only to be declined and then handed over to their RAF counterparts. Some US bases were never actually started but remained named and therefore official sites even though they remained as farmers fields! The lead up to war led to a massive change in the British landscape. Keeping airfields secret led to many being built in remote areas and away from major towns. Little did the inhabitants of these quiet little villages know, but their population was about to increase, in some cases by thousands. In the next section we look at how the airfield was built, the process of construction and the difficulties faced during this phase. The creation of airfields was set, each plan was studied, trees, shrubs and hedges were removed, ditches filled and the land leveled to a maximum gradient of 1:60. First of all to reduce the risk of machinery being bogged down, perimeter tracks were built. 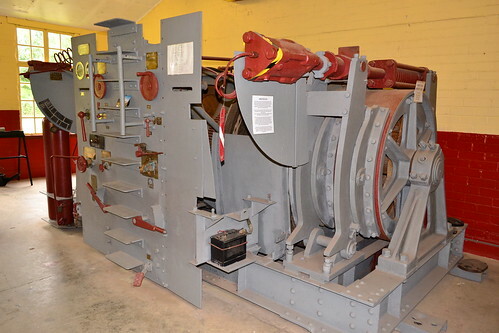 This allowed the delivery of heavy loads to any part of the site, and so were originally designed to carry support vehicles rather than aircraft. One reason why so many grassed airfields had hard perimeter tracks. With such a big workforce being drafted in, accommodation for the workers would be needed, these would generally be the huts that would be used for the aircrews and other personnel on the base once active. Drainage and dry storage was needed as a matter of urgency, and were usually a priority even before the accommodation areas. Buildings would be built using a range of materials. Hiding these enormous excavations was going to a headache for the authorities. How do you hide a building site covering many acres? (Average grassed stations covered 200 – 400 acres whilst those with runways were around 500 acres extending to over 1,000 by the war’s end). Numerous strategies were tried from painting the ground to covering it with coal dust, even adding wood chip to the concrete surfaces was used all with little real impact. Any spy or reconnaissance pilot worth his salt would have spotted the works and reported back immediately. Gradually the airfield developed. Workers worked in shifts covering a 24 hour working day, seven days a week, this meant that the construction period was relatively short and the completion rapid. By the end of the war some £200 million worth of work had been carried out involving somewhere in the region of 130,000 individuals including engineering workers, and building sub-contractors. As the site neared completion, RAF staff would begin moving in. The stores officer or ‘Equipment manager’ would often be first, ordering the necessary supplies to accommodate the forthcoming personnel. He would usually be followed by a NAFFI and a medical officer who would officially declare the site ready for occupation. Once this had been given the ground crews would be brought in, followed by aircrews and the aircraft. Even with a newly opened site, it was rare that it was ever fully finished, often accommodation was rudimentary or cooking facilities limited. In some cases tents were the order of the day until construction was completed. Great emphasis was placed on getting the site open and operational rather than ready. In some cases ground crews, who were otherwise waiting for aircraft to arrive, would take to shovels and picks to complete or improve upon work that had been started on site. Also the airfield needed naming. Names were usually taken from the nearest village or town, and where confusion might arise from a similar name, it could then be taken from an alternative nearby village. This is why some airfields appear to be quite distant from their respective named locations. Alternatives to this would be geographical features or alternatively local farms e.g RAF Twinwood Farm. The Americans used the system of numbering partly because (a) the American airmen were unable to pronounce accurately some of the English names and were often found getting confused by them, and (b) the American administration system made it easier to use numbers rather than names. By now the airfield was built, or at least open, the first unit would arrive and airfield defences would be set up. Military personnel would become established and operations would soon begin. All this could occur within months, it was a massive undertaking achieved in very little time. In the next part we look at the architecture of British airfields, how the idea of replication in design led to architectural developments, and how the demand for materials led to changes in airfield buildings. Any of these airfield developments had to be in line with guidelines laid down by both the Royal Fine Arts Commission and the Society for the Preservation of Rural England, hardly what you’d want in such difficult times! These restrictions however, would initiate a building design that would initially be both functional and aesthetically pleasing, with standard designs varying only through local conditions (suppliers of local brick for example). In the early schemes a ‘Georgian’ style of architecture was chosen for all permanent brick buildings, distinguished by their pillars and ornate archways, often seen on the entrances to Officers Quarters. Standard designs allowed for replication across numerous airfields, the idea being an officer could lift his room from one site and drop it directly on another. RAF West Malling, (built under Scheme M), reflecting this with Stradishall, (Scheme A), above. All buildings were constructed from brick with roofing tiles chosen accordingly for the local conditions. As the schemes progressed and brick became scarce, concrete was used as a cheap and strong substitute, certainly for technical buildings but less so for administration and domestic structures. As each scheme was replaced, any previous buildings would have remained (some modified to the new standard), thus some sites will have had a range of building types, often leading to confusion and a mix of architectural styles. The accommodation areas themselves changed too. In the early war years and as the awareness of air attack increased, accommodation was built away from the main airfield site and outside of the airfield perimeter. Classed as either ‘dispersed’ or ‘non-dispersed’, they were identified by the location of these domestic sites, where ‘non-dispersed’ were within the perimeter, and dispersed were beyond the main perimeter area of the airfield. The changing face of Barrack Blocks. 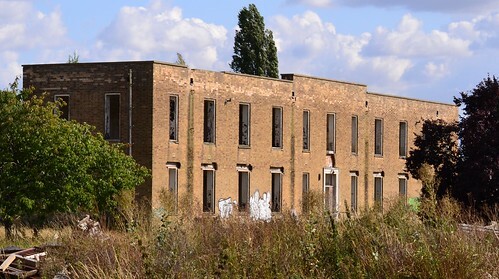 A Type Q Barrack block at RAF Upwood, built to design 444/36, to accommodate 3 NCOs and 68 aircraftsmen. 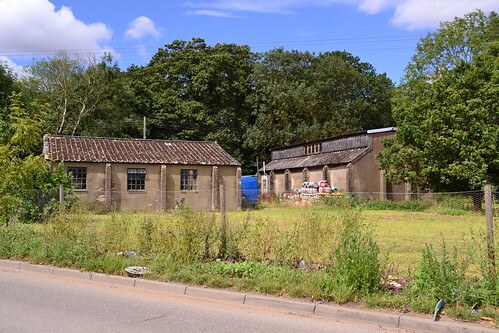 Compare this flat-roofed, expansion period building to the later Nissen hut. In these early stages little consideration was given to air attack, and so ‘non-dispersed’ sites were still being constructed at the beginning of the war. The benefit of these sites being that all personnel were in close proximity, general accommodation buildings often being built around the parade ground, and with all the amenities under one roof. These sites also saw the segregation between officers, sergeants and other ranks along with separate married (many with servants quarters) and single quarters. However, with the outbreak of war and as a result of austerity measures, the building of separate married quarters ceased. Examples of these early non-dispersed designs include: Stradishall, Marham, Tern Hill, Waddington and Feltwell. RAF Debden, a non-dispersed site where accommodation and administrative areas were collectively close to the main airfield site within the outer perimeter (IWM17560). The layout of these barrack blocks, took on the familiar ‘H’ shape, a design that replaced the initial ‘T’ shape of the post First World War and inter-war years. The ‘H’ Block became the standard design and gave a distinct shape to accommodation blocks on these prewar non dispersed airfields. As the awareness of the dangers of non-dispersed designs became all too apparent, dispersed sites became the norm, where domestic areas were located a good distance from the main airfield site. Dispersed accommodation could have many sites, depending largely upon the nature of the airfield (Bomber, Fighter etc), when it was built and whether it was operated by the RAF or USAAF. In these later dispersed schemes, domestic sites became more temporary in nature, whilst some remained as brick, many were built as prefabricated units often as Nissen or Quonset style huts, often due in part to the shortage of brick for building and the speed at which they could be erected. With the changes in dispersing accommodation blocks away from the main airfield, safety increased but both administrative and operational effectiveness noticeably dropped. It was going to be a fine balance between keeping a safe distance and achieving maximum effectiveness. 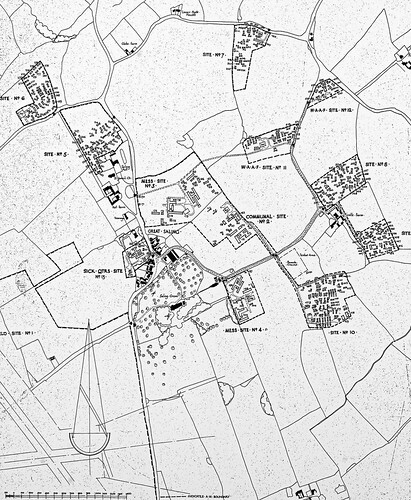 Depending upon local topography, these domestic areas could be situated as much as two miles from the airfield site, wooded areas being utilised where possible to hide the location of huts; blocks were randomised in their position to break up the appearance of housing, and pathways weaved their way round the sites to reduce their visual impact. In most later airfields, a public road would separate the technical and accommodation sites, with as many as thirteen or fourteen sites becoming common place. The separation of WAAFs from RAF communal quarters also ceased, men and women now allowed to mix rather than having the separate sites for each. As a result many post 1942 sites had fewer dispersed sites then those of pre 1942. The design of the technical areas also took on a new look. The prewar practice of squadrons offices being attached to the hangar was dropped, these also being placed away from the main technical site, dispersals for ground crew or waiting pilots were spread about the perimeter so airmen could be closer to the aircraft but far away enough to be safe in the case of attack. 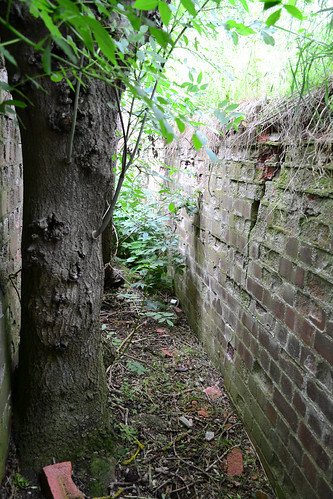 This led to a number of buildings appearing on the outer reaches of the airfield, along perimeter tracks and near to hardstands, often these were brick, small and square, others more temporary. Further changes occurred with the reduction in available materials. These changes have given rise to a wide variation in building design, again many airfields having a variety of buildings using different materials. Initially, buildings built of brick were strong and commonplace, but as this became both scarce and time-consuming to build, alternative forms were found. Timber followed on, but it too proved to be time-consuming to manufacture, and by 1940 acutely rare also. A range of materials were looked into, using a mix of timber and concrete, plasterboard and concrete, but they were all below the Air Ministry standard. Even so, many were accepted as design alternatives and used in temporary building construction. 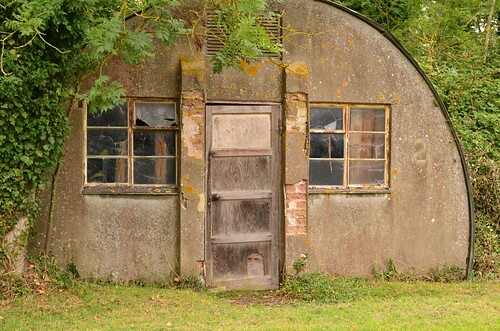 1940 saw the return of the 1916 designed Nissen hut, a curved hut that bolted together in widths of 16, 24 or 30 feet. A cold but effective hut it was commonplace on many airfields as both accommodation huts and technical huts, many being sold post war, and ending up in farmer’s fields many miles from the nearest airfield. With the arrival of the USAAF in 1942-3, they brought with them the Quonset hut, bigger in design than the Nissen, they are mainly distinguishable by their curvatures, the Quonset being semi-circular to the ground whilst the Nissen gave a 210o curvature. This extra curvature gave greater use of ground space, but lacked in overall space compared to it US counterpart. A Quonset hut at Matching Green. Note the curvature at ground level. 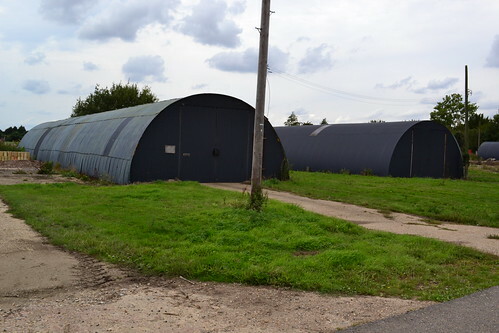 The Nissen hut had a larger curvature giving greater ground space – RAF Fersfield. Even this material became in short supply, metal being scare and urgently required for the building of military hardware. In 1942 the Ministry of Works took over control of hut design, manufacture and supply, and various new designs were brought into play. Asbestos became popular again, with the US being able to supply large quantities of the material. Uni-Seco Ltd, Turners Asbestos and Universal Handcraft being examples introduced at this time. The final design to be used, was that of the Orlit, a reinforced concrete panel and post design that slots together to form the walls and roof. Also know as the British Concrete Federation (BCF) design they were quick to erect and lasted from many years. This type of design was used for emergency housing in the post war period and has since proven to be degrading to the point that some of these properties have been condemned. Thus the architecture of airfield buildings took on many guises, from permanent brick designs, through timber, timber and plasterboard mixes, various metal design, asbestos and finally concrete, all of which gave a change in shape and design examples of which could appear on many airfields. The most common surviving examples today being the Nissen hut. We next move on to the runway, the very heart of the airfield and often the defining factor in its designation. In the pre-war years, the development of hard runways and large airfields was a new phenomena, hard surfaces being a new aspect still very much a topic of considerable controversy. In the First World War, water logging and mud was an issue even for the small biplanes that filled the skies over Britain and France. To overcome this, ash was spread over landing surfaces and to some degree successfully, but even though many local remedies were tried, it wouldn’t be taken seriously until the Second World War loomed. 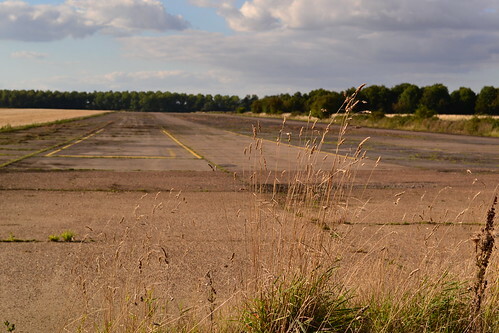 Runways like this one at Glatton (Conington) remain in good condition and used by the local flying club. At this point the typical airfield layout included up to four grass runways, one of 1,300 x 400 yards and three of 1,000 x 200 yards, many were even smaller. Bomber and Fighter Command, realising that not only would the new era of aircraft call for longer, hard runways on its airfields, but the need to maintain year round activity was essential if Britain was to defeat the Luftwaffe. Both Fighter and Bomber Command pushed the Government to allow these to be developed, on the one hand Sir Hugh Dowding, fighting the corner for Fighter Command, pressed home the need for hard surfaces on his fighter airfields, whilst Sir Arthur Harris on the other, pushed for hard surfaces on his bomber airfields. The entire process was lengthy and complex, and lacked in-depth, professional knowledge. The first hard ‘pavements’ later runways and taxi ways, being constructed based on road building techniques and knowledge. So before any firm decisions could be made, trials would need to be carried out to determine not only whether or not they were indeed needed, but if so, how they should be best constructed. Initial steps in runway construction was started as early as 1937, where ‘flexible’ runways were constructed comprising layers of brick or stone covered with two further layers of tarmac and a coat of asphalt to seal the structure in. Concrete pavements, which proved to be much stronger were either 150 mm or 200 mm thick slabs laid directly onto the ground after the topsoil had been removed by heavy machinery. As would be expected, these early designs failed quite quickly under the heavy loads of the fighters and bombers that were coming into service. Rapid repairs were carried by adding a further layer of tarmac (6.5cm) and another layer (2cm) of sealant. These early flexible constructions continued to fail whereas the concrete designs stood up to much more wear and tear and proved longer lasting. However, time was short and the learning curve would be steep. The test to determine these needs was to take a Whitley bomber, laden to equal its full operational weight, and taxi it across a grassed surface. A rather primitive assessment, it was intended to ascertain the effects of the aircraft on the ground beneath. Trials were first carried out at Farnborough and then Odiham, and these were generally successful, the Whitley only bogging down on recently disturbed soils. Further trials were then carried out at RAF Stradishall in March 1938, and the results were a little more mixed. Whilst no take offs or landings took place during these trials, the general agreement was that more powerful bombers would have no problems using grassed surfaces, as long as the ground was properly prepared and well maintained. All well and good when the soils were dry and well-drained. By April 1939, the Air Ministry conceded, and agreed to lay runways at a small number of fighter and bomber airfields, of which Kenley, Biggin Hill, Debden and Stradishall were identified. Whilst construction was slow, only two fighters airfields being completed by the outbreak of war, progress was finally being made. These initial runways were only 800 yards long and 50 yards wide, but were extended later that year to 1,000 yards long, as aircraft were repeatedly running off the ends on to the grassed areas. Over the years Stradishall in particular, would be further developed, its longest runway eventually extending to 2,000 yards. The runway at Charterhall in the borders, breaking up after many years of use both by training units and as a motor racing circuit post war. During the early war years, the demand for airfields grew. By early 1940 the requirement was for three runways as close as possible at 60o to each other, and of a minimum length of 1,000 yards with room for extension up to 1,400 yards. This then became the norm by late 1940 especially at bomber airfields, with the main runway being 1,400 yards and subsidiaries at 1,100 yards. A month later, this increased by another 200 yards with a requirement to be able to extend to 2,000 and 1,400 yards respectively. By the summer of 1941, the length of runways had again increased, all stations would now have a main runway of 2,000 yards and two subsidiaries of 1,400 yards and where this was not possible, then a minimum of 1,600 and 1,100 yards (fighter and night fighter stations being shorter at 1,300 and 1,400 yards respectively). The harsh winters were less than ideal for laying concrete (by far the best material for the job) but any delay could mean the difference between success and failure. Elaborate testing was therefore passed over, materials were laid and experience led the way. This method of trail and error, led to many instances of runways having to be dug up and relaid, this in itself led to problems as aircraft, men and machinery had to then be moved and housed elsewhere. The American Eighth Air Force suffered greatly with these problem, fully laden bombers repeatedly breaking through the surface or falling off the edges as it gave way. Another consideration was that of training and satellite airfields. As the need for new pilots increased, the training of new recruits intensified. The harsh winters were causing major headaches for these airfields as mud, stones and other winter debris was causing continuous problems for flying. With both man power and materials being in short supply, suitable alternatives were sought. A number of solutions were offered all very similar in their design and material. The answer it seemed lay in steel matting – of which twelve different types were used – the more common being : Sommerfeld Track, Pierced Steel Planking (PSP – also called Marston Mat), or Square Mesh Track (SMT). Sommerfeld track was a steel mat designed by Austrian Kurt Sommerfeld. The tracking was adapted from a First World War idea, and was a steel mat that when arrived, was rolled up in rolls 3.25 m (10 ft 8 in) wide by 23 m (75 ft 6 in) long. It was so well designed that a full track could be laid, by an unskilled force, in a matter of hours. Each section could be replaced easily if damaged, and the entire track could be lifted and transported by lorry, aeroplane or boat to another location and then reused. Tracking had to be robust, it had to be able to withstand heavy landings and be non-conspicuous from the air. Sommerfeld track met both of these, and other stringent criteria very well, although it wasn’t without its problems. Crews often complained of a build up of mud after heavy rain, and concerns over both tyre and undercarriage damage were also extensively voiced; several records reporting tail wheels being ripped off after catching in the track lattice. Because of the poor state and short length of runways, bombers were still regularly running off the ends, especially at night, or being unable to fly because the surfaces were poor or even unusable. A number of ideas were tested out to alleviate the problem, one such idea led to twenty sites testing arrester hook facilities. Several heavy bombers: Halifax, Manchester, Stirlings and later the Lancaster, were all modified to undertake these trials, with Woodhall Spa becoming the first airfield to have the full complement of six arrester sets. Runway arrester gear at Woodhall Spa. The idea was met with scepticism, but trials went ahead and in January 1942, a list of priority airfields was sent out to the Headquarters of No. 1,3,4, and 5 Groups RAF detailing those twenty sites selected for the equipment. 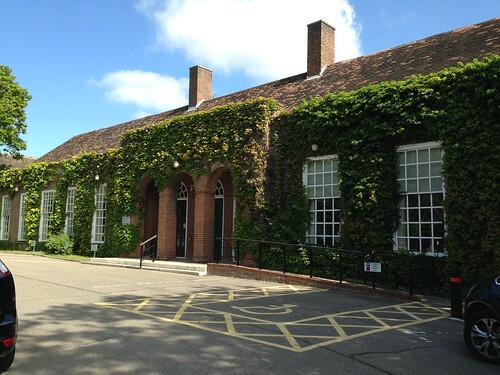 At the top of the list was RAF Woodhall Spa in Lincolnshire, followed by Bottesford, Swinderby, Ossington, Syerston, Middleton St. George, Linton, and ending with Waterbeach and Stradishall. By late 1942 Woodhall Spa was ready and in October, five landings were made by an Avro Manchester. A month later the decision was made to install units at all major operational airfields, but this never came to fruition and the idea was soon mothballed. By 1943, it had been forgotten about and the 120 or so units built were scrapped (many being left buried where they were laid). It was finally during early 1942 that a standard design airfield would be put in place. Known as the Class ‘A’, it would be the standard to which all new airfields and updated older sites would be made. A Class A airfield would be designed around three hard concrete runways, shaped like an ‘A’ with each runway at 60o to each other where possible. The main runway would be aligned with the prevailing wind again were possible to allow aircraft to take off/land into the wind as often as possible (north-east, south-west). In several cases, due to land features and local restrictions, this was not always possible, and so many permutations of design were seen as a result. Rapidly becoming the largest part of the airfield layout, the runways and other paved areas – perimeters tracks, aprons and hardstands – were now given high priority. The standard now called for a main runway of 2,000 yards with two subsidiaries of 1,400 yards. Each of these would be 50 yards wide whilst the connecting perimeter tracks would be 50 feet wide. Along side these runways would be an emergency landing strip, a grassed area given a landing surface of 400 and 200 yards respectively. Dues to the high numbers of bombers returning badly damaged and unable to make safe and proper landings, a small number of emergency strips were created by extending the main runways to 4,000 yards long and 400 yards wide. One such airfield was RAF Manston in Kent. Being on of the closest airfields to the continent, it was often the first place a stricken aircraft, especially a bomber, would seek out. Whilst the general layout of airfields did not change for the remainder of the war, some further runways were extended to 3,000 yards, one such example being RAF Sculthorpe in Norfolk which was prepared to take the heavy B29 ‘Superfortress’ and post war, the B-36 ‘Peacemaker’. A further point worth mentioning here is that of dispersals, not required pre-war, they were also an aspect of airfield architecture that were born out of the Second World War. In the inter-war years, aircraft were housed either on a central pan (apron or ramp) or within hangars. These collections of aircraft were easy targets and even a small amount of munitions could cause huge damage. 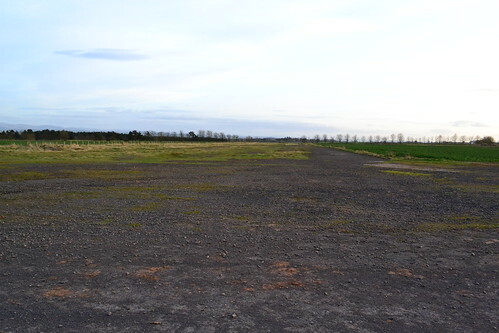 In 1939 the need for dispersals was therefore recognised and so to address the issue, hedges were removed and tracks created that took aircraft away from the main runway but kept them within easy reach of the airfield site. The initial design was that of the ‘frying pan’ a 150 ft circle connected to the perimeter track by a small concrete track. However, by 1942, it was found that aircraft were clogging up these tracks, some even ‘falling off’ the concrete onto soft soil and so blocking following aircraft in their tracks. The answer was the ‘spectacle’ or ‘loop’ hardstand, so-called by their oval shape, generally in pairs, that allow aircraft in and out without the need to turn or block access tracks. From 1942 onward, this model became the standard hardstand for all Class A airfields, and the aim was to have 50 such hardstands placed strategically around the perimeter, with 25 at satellite airfields. As the threat of attack diminished toward the end of the war, ‘finger’ or ‘star’ dispersals began to appear, much less effective than the predecessors, they were however cheaper and easier to construct. In addition to hardstands, pens were built on fighter stations. 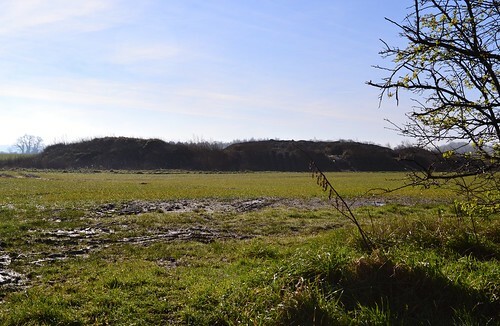 The first, an experimental pit, was dug at Feltwell, whilst overly expensive and obtrusive, it did lead the way to aircraft pens later on, pens that were developed as either type ‘B’ or ‘E’ on these fighter airfields. The main difference here is that the early type ‘B’ had cranked side walls whereas the ‘E’ had walls that were straight. The former requiring more space, was later phased out in favour of the ‘E’, named so by its shape, using side and back walls to protect the fighter or small bomber located within. The remains of a Type ‘B’ Fighter Pen at Matlaske. 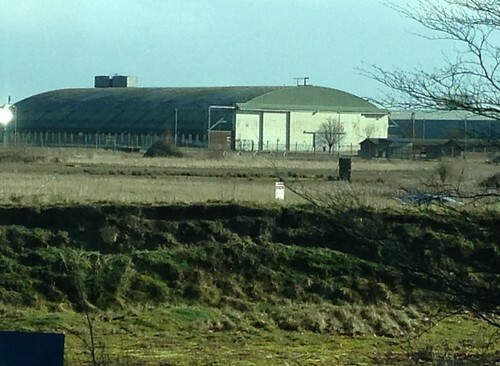 A Type ‘B’ Pen at RAF Macmerry. The cranked wall can be seen to the right, with the central wall on the left. The entrance is to the bottom right. Examples of these pens were located at Matlaske (type ‘B’ – built to design 7151/41) and Macmerry in Scotland, whilst the type ‘E’ were found on airfields especially those around London that included Biggin HiIl, Kenley and North Weald. One of the ‘E’ type pens found at Kings Cliffe. Adapted with rifle slits for additional defence. These pens were designed to specific dimensions and were designed as either a ‘Hurricane’ or ‘Blenheim’ to accommodate either a single engined or twin-engined aircraft. Within the back wall of these pens was a shelter for up to 25 personnel, and in some cases, they had Stanton Shelters built-in to the structures. Some, for example, at Kings Cliffe in Northampton, remain with rifle slits for additional protection from ground forces. Inside the aircraft pen shelter at King’s Cliffe. 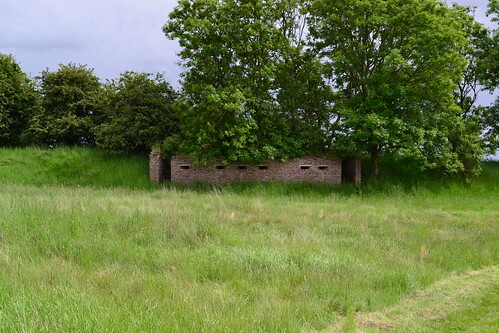 Whilst the majority of these shelters were manufactured using banks of soil, sandbags, brick or concrete, there was a least one example at RAF Drem, in Scotland which used logs cut to size and shape and built in the style of a Scandinavian house. It is these various designs of aircraft pen that paved the way to modern hardened aircraft shelters (HAS) seen on military airfields today. From the early days of grass runways to the massive lengths of concrete that were created up to and after the mid 1940s, runways and hardstands have become a defining factor in airfield design. The sole purpose of an airfield – to get aircraft off the ground as quickly as possible, get them to their target and them get them home again – led to the development of both runway lengths and construction materials, much of which has paved the way for modern airfields today. These early leaps into runway designs have enabled larger and heavier aircraft to make those important journeys that we very much take for granted in this the modern world of air travel and general aviation. In the next section we look at one of the buildings most associated with the airfield. An early form of aircraft storage, its role changed as it was soon realised that aircraft needed to be dispersed and not grouped together on large aprons as they were in the prewar era. Aesthetics and neatly lined up aircraft were no longer an important factor in front line flying, but safety and the ability to repair aircraft quickly and efficiently were. Here we introduce the hangar, a huge building often of a temporary or transportable nature, that became one of the more longer lasting structures of airfield architecture. The topic of aircraft hangars is well versed in a large number of books and internet references. They, like the runways, can explain much about the history and use of an airfield, being the largest single building on any airfield site. Distinguishing features between hangar types is often difficult to see, many now re-clad or updated with modern features, doors or materials, even the differences between some designs is so small, without technical drawings or measurements, ascertaining the type can be all but impossible. Hangars (or aircraft sheds as they were initially called) have been fairly constant in design, however, different services used different types, Admiralty seaplane sheds for example, were primarily side opening, whereas RAF hangars were generally front opening. Design and construction was undertaken by numerous companies (Herbertson & Co. Ltd., Nortons Ltd., Teeside Bridge and Engineering Co. Ltd., and Sir William Arrol & Co.) and even Handley Page Aircraft Co. and Boulton & Paul dabbled with the idea. With so many forms being used, it is a topic both detailed and extremely wide. This is not therefore, intended to describe each and every hangar ever built (Second World War Air Ministry designs alone covered more than 56 types! ), but more a general realisation of the huge development they undertook during this expansion and wartime period on RAF / USAAF airfields. Figures quoted here are generally rounded. In order to understand the changes in aircraft hangars we need to briefly look at those of the First World War, where aircraft were stored in ‘sheds’, often made from canvas covering a wooden frame, or as a more permanent construction, completely wooden sheds with sliding doors. Later on these were built using metal (iron in particular) and were designed to be permanent, capable of housing several aircraft at a time. The First World War hangars were varied and often crude, some little more than glorified tents, but through development famous names such as the Bessonneau and Hervieu were created toward the end of the war. Hangars became so large that specialist units had to be created solely to transport, erect and maintain them, and their use became more widespread. The most common hangar of this period, the Bessonneau, was the first standard transportable hangar used on Royal Air Force airfields. Modern forms of it are still in use today, using different materials, they are quick to erect and offer reasonable protection from the weather outside. The Bessonneau was a wooden frame structure covered in canvas. It was a simplistic design, able to be erected in as little as two days by a group of 20 skilled men. Heavy canvas doors open at one end allowing aircraft to be moved in and out with relative ease. The problem with these hangars was that the canvas was prone to freezing in winter and therefore becoming difficult to use. There were two models of the Bessonneau built, differing only in their length – either 79 feet or 118 feet – but both were 65 feet wide. The interwar and early war years were perhaps understandably, the years in which the greatest hangar development occurred. The Air Ministry – the body overseeing the works – decided upon a system of ‘structure type’ using names and designations such as, Type ‘A’, ‘B’, ‘C’, Bellman, ‘T2’, etc., and just like the expansion period schemes, they progressed through this system as new developments came about. The first type was the Type ‘A’, a permanent design, originating in 1924, it was used well into the 1930s when it was gradually replaced during the expansion period. Some examples did last well into the war and even beyond, for example, North Weald, one of the first airfields to be allocated a Type ‘A’, still uses one today. Type A Hangar at North Weald. One of the first stations to have these types of Hangar, it has workshops attached to the Hangar side. The Type ‘A’ is probably the first to represent the modern hangar, doors at both ends in leaves of four running on rails. Workshops are attached to the hangar side, something that was discontinued as Britain entered the war. Walls were reinforced with concrete to protect from bomb splinters, and they were built 249 feet long and 122 feet wide. During the late 1920s, the Air Ministry published requirements for new heavy bombers, and these would require new hangars in which to maintain them. In response, the Ministry then updated the Type ‘A’ hangar to the Type ‘B’. In essence a larger version of the Type ‘A’, (160 ft span and 273 ft in length) the ‘B’ was named the ‘Goliath‘ with only three being built (each being a different length). One of these was at RAF Martlesham Heath and is still used today on what is now the industrial park. Like the Type ‘A’, the roof of the ‘B’ is possibly its most discernible feature, a series of trusses along its length crossing laterally over the roof. With expansion period demands increasing, further developments were needed, and it was envisaged that an increasing bomber size would be needed if substantial bomb loads were to be delivered deep into the continent. The current size of hangar was now considered too restrictive and so a new buildings would be needed. The requirements of the Air Ministry was for a hangar with a span of 150 feet and length of 300 feet. With these in place, new aircraft specifications could be issued. The Type ‘C’, (designed in 1934) as it was designated, would become the dominant building on any airfield and therefore visible from quite a distance. 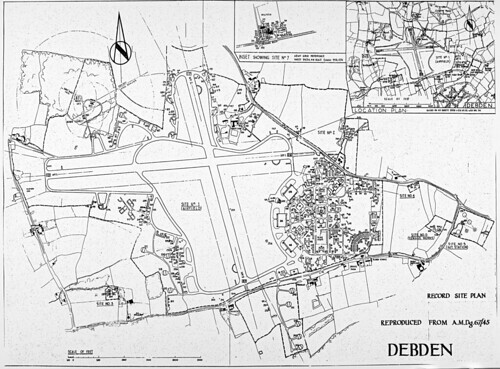 As airfield designs were subject to scrutiny by the Society for the Preservation of Rural England, local objections were taken into account during the design process. To appease any objections, the steel frame was covered with local brick or stone, keeping it inline with other buildings not only on the airfield, but houses and buildings erected locally. 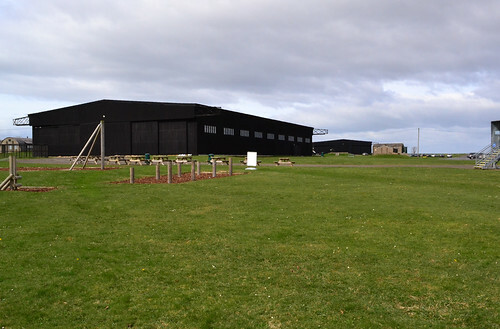 Most airfields during the expansion period were built with these hangars on site, and naturally went through a series of developments and improvements. This means, that there are many different forms of the Type ‘C’: gabled roof, hipped rafter and reinforced concrete. Another modified version of the ‘C’ appeared in 1938 and was designated the ‘C1’ (or ‘Protected’), this was an austerity measure development, reducing the amount of material used by lowering the roof height by 5 feet – internal metal work was also left partially exposed. 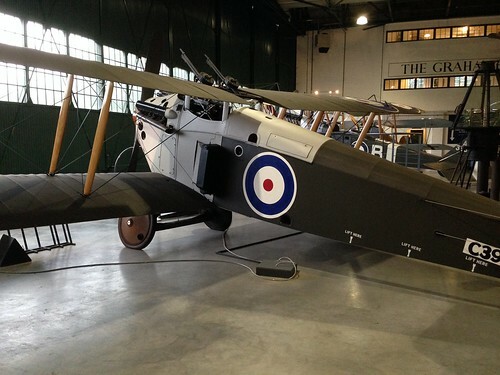 Both the ‘C’ and ‘C1’, continued to be built with offices, workshops and aircrew accommodation attached to the hangar side, the idea being that it was more efficient to do so for the repair of the aircraft inside. As these were larger in width and length than their predecessors, they would have six leaf doors also sliding on top and bottom rails. Type C at the former RAF Upwood. 1936 saw a dramatic change in hangar design, with two new requirements being issued by the Air Ministry. Firstly, storage space was now running out and so new facilities were required. These Aircraft Storage Unit Stations (ASU) would need their own hangar type, and so a requirement for these was put forward. Also at this time, the Ministry put out a demand for transportable hangars, these would replace the ageing Bessonneaus of the First World War. The response to these demands were three storage hangars and two temporary hangars. The Type ‘D’, ‘E’ and ‘L’ Hangars, were a development used specifically by the ASU stations, and they were not generally built on front line operational airfields. They were virtually identical in size to the Type ‘C’, but each type was marginally bigger in span 150 ft, 160 ft and 167 ft than the previous model, and all were the same length at 300 feet. The three types were different from previous hangars in that they had curved roofs, allowing the ‘E’ and ‘L’ to be covered with soil for protection and camouflage (the ‘D’ had straight side walls and therefore could not be covered). ASUs were built to assemble and disassemble aircraft for shipment to operational airfields in Britain or overseas. Aircraft were stored, in varying degrees of assembly within these units, and heavy hoists were often used to store aircraft ‘tail up’. However, with the outbreak of war, aircraft storage was thought better dispersed around the airfield and not concentrated in one space, so this method of storing aircraft was abandoned. 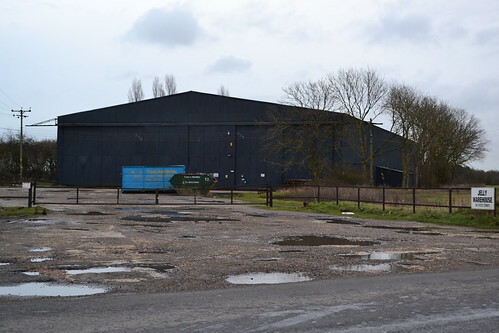 Many of these hangars still remain today, used by small industrial units or for farm storage. The next two types, the ‘J’ and ‘K’, were virtually identical in design, again with curved roofs, they were used for storage of aircraft. The ‘J’ can be found on many operational airfields, built in conjunction with other main hangars (Waterbeach is a very good example of this combination), whilst the ‘K’ was built on ASU stations. The design came in as a result of Expansion Scheme M, and was as a result of the call for 2,550 front line aircraft by March 1942. The main difference between the two, (other than their location) was in the roof structure, the ‘K’ having lifting tackle rails along its width, while the ‘J’ were along its length. The ‘K’, being used for storage of aircraft, didn’t have any windows, where as the ‘J’ did as offices and workshops were in use constantly. Like previous hangars, the ‘J’ and ‘K’ both had a span of 150 ft and a length of 300 ft.
A ‘J’ hangar located at RAF Waterbeach. The 1936 transportable hangar requirement, asked for a hangar that could be easily erected and didn’t require a permanent base. It also asked for doors at both ends and needed to be simplistic in design, with parts being interchangeable. These hangers also saw the separating of the office/workshop facilities previously built onto the side of the hangars, these now being located in buildings in the technical and administrative areas. After considering numerous designs, two were chosen and ultimately built. The first of these, and the primary choice, was the Bellman. Designed by an engineer within the Works Directorate, N.S. Bellman, they were smaller than previous hangars (88ft span and 175 ft on RAF bases) and could be built in under 500 hours by a dozen men. So successful, were they, that over 400 were built between 1938 and 1940 across a wide range of airfield types. Some of these examples even appeared in Russia. The second design, was the Callender (later Callender-Hamilton with modifications) Hangar, designed by the bridge design company Callender Cable and Construction. These had a span of 90 clear feet, with a length of 185 ft, and were used on both RAF and RNAS airfields. There were only eight of these built before the outbreak of war, examples of which appear at East Fortune, further examples with lower roof clearances (17 ft) being purchased after 1940. The Callender-Hamilton are best recognised by their lattice-work on the top door rails. As the war approached, 1939 – 1940 saw a transition period between ‘permanent’ and ‘temporary’ buildings, although many of these temporary buildings still stand today! Because of this change, many airfields had various hangars built, something that often gives a mix of hangar designs on one airfield which can cause confusion as to its age and origin. However, from this point on, all wartime hangars were designed as temporary hangars, designed with short lives and easily assembled / disassembled. By 1940, the Bellman was considered too small for the RAF’s requirements and a new design was going to be needed. An agreement between the Air Ministry and Teeside Bridge & Engineering resulted in the ‘T’ series of hangars, perhaps the most well-known of the hangar designs. The ‘T’ series covers a wide range of (temporary or transportable) hangars, each slightly different to the previous, but designed as three main types; T1 (90 ft span), T2 (113 ft) and T3 (66 ft). The length of each hangar varied depending upon local requirements and the number of additional bays added as needed. The design number e.g T2 (26) indicated the number of bays (26) and hence the length. The ‘T’ range were a diverse and complicated range, the ‘T2’ being sub split into 5 variants (T2, T2 Heavy Duty, TFB (flying Boat), TFBHD (flying boat heavy-duty) and T2MCS (marine craft shed), so the identification of each being difficult without measuring equipment. 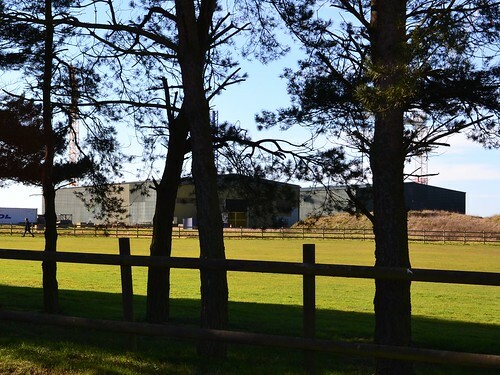 A T2 hangar at RAF Wratting Common. On first inspection the ‘T2’ and Bellman look virtually identical, both lightweight, steel lattice frames with metal side panels. The main distinctions are that the Bellman doors are flush with the top of the side panelling whereas the ‘T2’ has an extra level of panelling and so are not flush. The other difference is the lattice frame inside the roof, the ‘T2’ has only diagonal braces whereas the Bellman has vertical braces in addition to the diagonals. Both hangars have six leaf doors on sliding rails supported both top and bottom, allowing full width access. 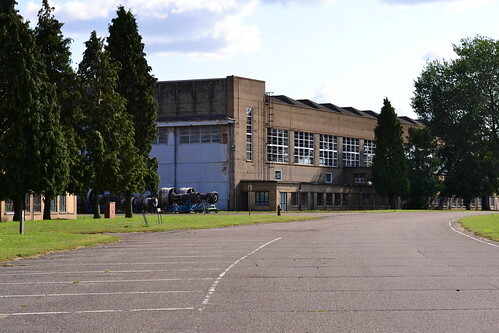 A final addition to the ‘T2’ were the Ministry of Aircraft Production Hangars the Type ‘A’ (A1 & A2) and Type ‘B’ (B1 & B2) built in the mid war years 1942-43 and funded by the Ministry of Aircraft Production. These hangars, not to be confused with the type ‘A’ and ‘B’ of the 1920s, were designed specifically for the repair of damaged aircraft especially operational aircraft on their own airfield. They were also erected at ASUs, and Satellite Landing Grounds (SLG). A B1 at RAF Wratting Common an RAF bomber station. The ‘B1’ and ‘B2’ were built specifically at Bomber Command airfields for the repair of damaged bombers thus eliminating the need to transport them long distances to specialist repair depots. Designed by T. Bedford Consulting Engineers they were eventually found on virtually all Bomber Command airfields by the end of the war and were manned by civilian repair organisations. Examples of both the ‘T2’ and ‘B1’ can be found in use at Wratting Common. ‘A1’ and ‘A2’ hangars on the other hand, whilst similar in design – metal cladding on metal frames – were slightly smaller and found only on aircraft factory airfields. Thus again there are virtually two identical hangars designated primarily by their location! 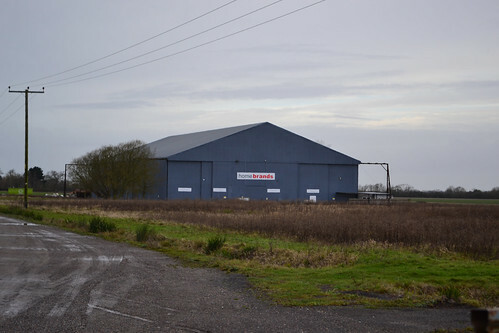 The last hangar to be commonly found on RAF / USAAF airfields were the blister hangar. A hangar of a temporary nature that usually used a curved metal frame covered in metal sheeting. The Blister hangar was the brainchild of architects and consulting engineers Norman & Dawbarn and William C. Inman of Miskins & Sons, and was designed to accommodate small span aircraft ideally fighters dispersed around the perimeter of airfields. Maintenance or storage could easily be carried in these hangars, and they could easily and quickly be erected, no base or foundations being required before hand. These types of hangar came in three designs, the standard blister, (timber construction), over type (light welded steel) and Extra Over (also light welded steel), and ranged in span from 45 – 70 feet, A further type built was that of Double extra Over and Dorman Long, a separate design similar in shape but securely bolted to foundations. Many of these hangars have now gone, the majority being dismantled and sold off, only to be erected elsewhere on farmland well away from their original location. The father of a friend of mine, was employed in this very role, one day finding a Spitfire inside a blister hangar which nobody claimed to own! By the end of the war, in excess of 900 ‘T2’ hangars were erected on British airfields including those built abroad. In 2004 it was thought there were about 100*7 left surviving on MOD property in Britain. A number have also survived on farmland used to store foodstuffs or machinery, or industrial sites. The ‘T2’ remained the main hangar in use by both the RAF and USAAF during the war, appearing on all Class ‘A’ airfields, occasionally with other models also being present. A number of other older models also continue to serve even to this day. Considering many of these were built as temporary buildings, they have survived remarkably well and are testament to the engineering design of the pre and early war years. This is by no means an exhaustive list of those hangars that were built during the period 1918 – 1945 (other examples include the: Aeroplane Twin Shed; RFC Sheds; Seaplane Sheds; General Service Sheds; Plane Stores; Running Sheds; Lamella (a German idea built in Britain); Hinaldi; Main Hangars; Lamson Hangars; Fromson Hangars; Robins Hangars; Butler (a US design); Merton; ‘S’ type Hangars (RNAS); Pentad Hangar and Boulton & Paul Hangars and of course post war examples such as the Gaydon), but hopefully it has shone a glimmer of light on these remarkable structures that often dominated the skyline and that remain the centrepiece of many a disused airfield today. In the next section we shall look at that other main iconic building in airfield design, the watch office. 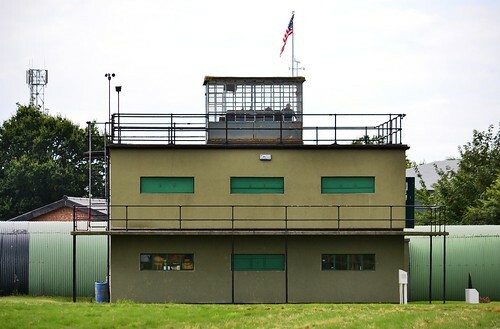 The Watch office, Watch Tower or in American terms Control Tower, was the centre piece of any airfield, the place in which all operations were controlled. Even today, the control tower is the one feature that stands high above the rest of the airfield with commanding views across the entire site. Many of these watch offices remain today, some as fabulous museums, some as private dwellings, but many are sadly derelict or even worse – gone altogether. This that do survive create a haunting and evocative feeling when seen from inside. The beautifully restored Thorpe Abbots Watch Office (design 15683/41). Unlike hangar development, the watch office appeared quite late in the development of the airfield, only really coming into being as war seemed inevitable. Before this, a rudimentary office was often all that was used, usually attached to the side of the main hangar, and was used to ‘book’ aircraft in and out. But by the mid war period the watch office had become a major structure on the airfield, a standard design (depending upon the airfield use) with two or more floors and often a ‘glass house’ for observation purposes. For obvious reasons the watch office was built away from other buildings with clear sight over the entire airfield, an important aspect if controllers were to keep watch on the many aircraft that were moving about the airfield space. 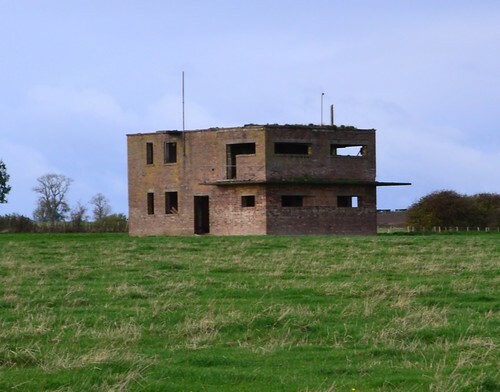 A vital asset to the airfield it was often targeted by marauding bombers, and in the case of attack, the controllers within would relocate to an emergency battle headquarters, hidden at ground level on a remote part of the airfield, but still with views across the site. The Watch Office as we know it was first seen on military airfields in 1926 and resembled a small bungalow with bay windows. Those constructed on bomber bases would be slightly smaller than those on fighter bases, a fighter base office having a pilots office attached. The idea behind this was to keep pilots as close to the airfield control centre so they could quickly be scrambled and report back to the airfield controller on their return. These early design were found on airfields such as Bircham Newton in Norfolk, Hendon and Tangmere and were all built to the same basic 1926 drawing design only modified to take the extra pilots room. The standard shape of the World War 2 Watch Office stems back to the mid 1930s, with the introduction of a two-storey building that was square in design. Like similar buildings of its time, it was brick, a building material that was replaced with concrete, in 1936. West Malling a 5845/39 design which is now a coffee shop. By the end of the expansion period, and with the introduction of hard runways, it was realised that the non-dispersed sites gave poor visibility for early watch offices, views across the airfields were not clear and so a quick remedy was called for. The answer lay in two choices, (a) demolish the current buildings and rebuild it in a better location, or (b) add an extension. In many cases the former was the better idea and this progressed quite quickly, however, where the latter was chosen, remedial work required alteration of the building whilst it remained in use. A further complication to these designs was the introduction of meteorological sections, which all new buildings erected at the beginning of the war now had. This gave a mix of design styles, enough though there was only a small selection of design drawings from which to work. 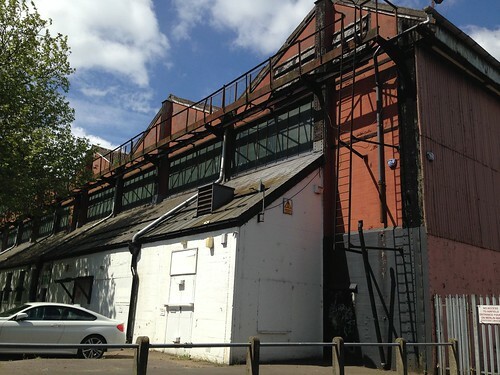 These late expansion period and early war designs introduced the idea of ‘viewing platforms’ or parapets, surrounded by safety railings along the front of the building. These deign also had very large glass fronted walls, bright and airy they allowed a lot of light to enter the building but gave cause for concern later on, when it was realised that a bomb blast would cause severed injury to the occupants in an attack. It was also found that during night operations, large windows were more difficult to black out and so smaller windows offered both better protection and greater ease of black out. As building materials became scare, particularly wood and brick, concrete became the norm. This change also led to drawing changes even though the basic design inside and out, was the same. In order to appreciate the changes to watch office designs, one needs to consider the different roles that airfields played during the war. Bomber Command airfields would have a differ office to a fighter Command airfield, which in turn, had a different office to a satellite or night-fighter station. Watch Offices give commanding views across the airfield. (Thorpe Abbots). The regional control stations where these first offices were being built were certainly getting the better choice at this time, standard fighter and bomber airfields having to use inferior designs that very soon became outdated and inadequate for the needs of the airfield. During the massive building programme of 1941/42, there was some effort made to standardise all airfield Watch Offices, this resulted in the 1941 design drawing no. 12779/41. This was to be the basic airfield watch office design, with its parapet, six large windows to the front and outside access steps. 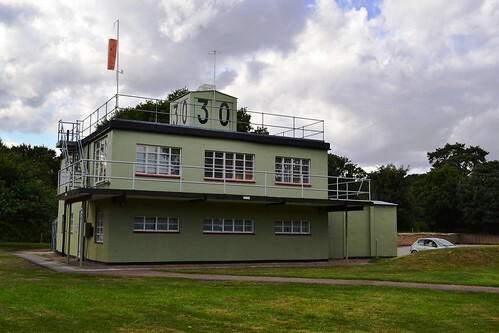 As older airfields were brought up to Class A Specification, many had these new Watch Offices built to replace the older original ones. Some simply had adaptation of the original. Here the use of the airfield had a bearing on the watch office modification / design, and whilst the basic 12779/41 model was employed, slight variations did exist where the airfield was not a bomber airfield. Therefore various adaptations of this did follow, examples of which include the slightly smaller 13023/41 (RAF Cottam), those with modified smaller windows 15371/41 (Kimbolton) and 343/43 (Martlesham Heath), and the smaller Night-Fighter design 15684/41 (Winfield). Being a Night-Fighter station Winfield, had the same basic design but construction methods were totally different. This new design 15684/41, would become standard at all night fighter bases. All these alternative designs appear outwardly very similar to the original, but differ mainly in window design only, although the physical size of some is different. The Night-Fighter station Watch Office at Winfield (15684/41) is a similar design but smaller, having only four windows in the front. This design, 343/43, eventually became the most common design for watch offices and appeared on all operational stations and Operation Training Unit airfields after 1943, using a set of six half-size windows across the front. The smaller windows of Parham (Framlingham) were half the original design size (12779/41 modified to 343/43). 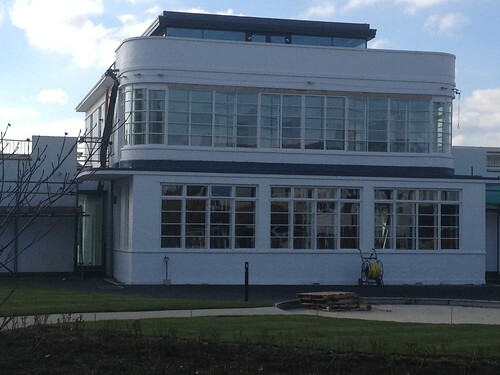 A further addition was the glass observation room located on the roof of the Watch Office. These were generally only applied to Group control offices, and gave an excellent all round unrestricted view of the entire airfield. Examples that exist today, such as Framlingham above, are replicas but have been built to very high standards. 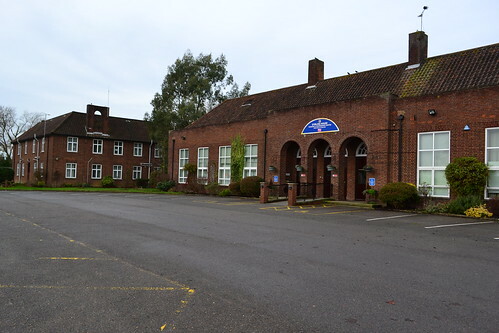 Martlesham Heath is a similar design to Framlingham (modified to 343/43) – Note the runway heading board on the roof. At the end of the war some airfields such as Sculthorpe and West Raynham had their Watch Offices modified as they changed roles to Very Heavy Bomber Stations. This new design 294/45, utilised the former building having an extra floor added and then the octagonal ‘glass house’ or Visual Control Room with slanted glass to reduce glare. 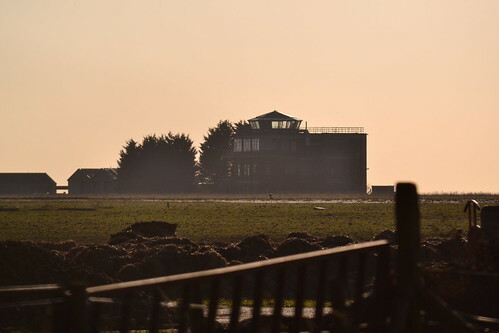 Sculthorpe’s modified tower gives 360 degree views over the airfield. A three-story block it utilises the former World War 2 Watch Office. 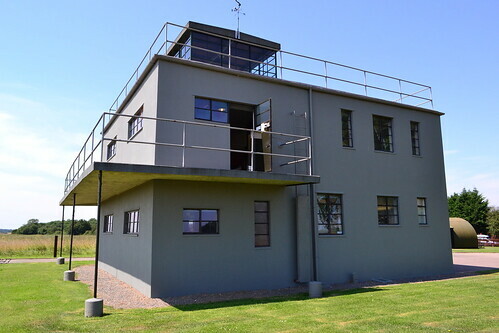 The Watch Office has been the hub of airfield command and control since the mid 1930s, it has developed from the humble shed to a multi-functional technologically advanced building dominating the skyline of the airfield today. Sadly though, many are now gone, and of those that are left only a few remain in good condition or open to the public. Development of the war-time airfield was complex and rapid, it incorporated numerous buildings’ designs and shapes, certainly far too many to cover here; the wide variety of technical buildings, synthetic trainers, parachute stores, headquarters and general stores, all changing as the war progressed. The design and materials used in these structures was as varied as the designs themselves. But as the RAF grew so too did the airfields they used. The runways, the hangars, the technical buildings and accommodation sites have all grown alongside. Sadly many of these buildings have now vanished, but the process and speed at which they developed has been unprecedented. From humble grass strips with wooden shacks to enormous conurbations with numerous buildings, they have become iconic symbols representing decades of both aviation history and human sacrifice. Notes, sources and further reading. *5 NIMBY – Acronym used to describe the objections of local planning projects. (Not In My Back Yard). *7Technical Bulletin 02/02 “World War II Hangars – Guide to Hangar Identification” Ministry of Defence (February 2002).